The U.S. post office is already the worst place on Earth. Let's just clear that up right now. It's musty. There's a glass case that holds just boxes that look like they've been there since 1910. And postal workers always look like they just walked out of a showing of Schindler's List. But then a few months ago they shut down my post office and started re-routing the mail to another location. That's when the U.S. post office (particularly my branch) became the worst place in the universe. But let's back up a few years, so you can hear everything that brought me to this conclusion. It all started with an eviction notice. After my landlord bought the building I live in, the man who used to own the building just continued to live in his apartment on the first floor like nothing had changed, like some kind of Miss Havisham of building ownership. The city finally put up an official eviction notice. He moved out or was lost in an unfortunate wedding dress fire. I'm not sure what happened. But a week after I moved in, the eviction notice was still on the door downstairs. And although it specified that it was for only the first floor apartment, the mailman just continued not delivering my mail, assuming I was living there illegally. I left him notes. I called the post office. I wasn't getting any bills or checks. I finally had to walk down to the post office to confront him and convince him I wasn't a squatter. Reluctantly, the mailman finally agreed to give me my mail. But you could tell that he wasn't happy about it. 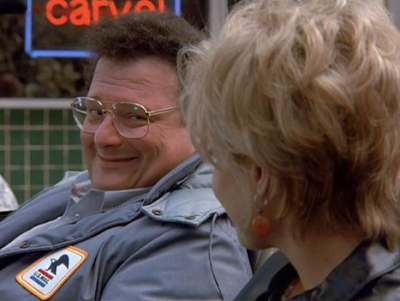 You can imagine him as Newman if it helps you picture the delight the mailman had felt about standing between me and my mail. The second time I had to go down to the post office and yell at people came when I noticed someone had been opening my mail. A Christmas card from my grandma showed up torn just so. A bill dangling out of its envelope. I filed a complaint. What can I say? I'm 1) suspicious and 2) a complainer. After I complained, my mail started turning up in perfect condition again. Odd. But nothing prepared me for our post office branch being closed and integrated into another one. Last week, I walked over to collect a package of things I had ordered online. If it helps garner sympathy to my situation, you can imagine these things were Christmas gifts for poor children. When I walked in, the line had 20 or more people in it, all of us trying to collect and mail packages for the holidays. Now, if you are familiar with standing in line at the worst post office in the universe, you already know how this works. There is one person at the front of the line who doesn't understand 1) how to swipe a credit card 2) cardboard boxes 3) that shipping live animals is illegal 4) why the post office won't take a check 5) why her son won't pick up her packages for her even though he has a car. She has 187,000 questions about every little aspect of shipping her package to Germany and, no, she doesn't have the address or know the name of the intended recipient. And with that, the line comes to a complete halt. By the time I left that day, blood shooting from my eyeballs, there were over 40 people standing in line. The line was so long, no one knew where to stand anymore and it just kind of coiled in the doorway. The next day I had another pink slip. Another package to pick up. Now, all of my issues would be resolved if the mailman would just leave my packages so I wouldn't have to go down there, but if you'll recall, my mailman is Newman and is still mad at me for yelling at him those [two] times. So, he leaves me pink slips instead and giggles all the way back to his mail truck. I decided to go as early in the day as possible. It was 11 AM when I walked through the door. There were three people in line. I silently congratulated myself. And then I stood, and stood, and stood, and stood there. For twenty minutes. I was third in line for 20 minutes. The customer at the window was like, "When did it start to cost money to send things? I demand to see a manager!" Finally, she left. The line moved forward, and soon I was first in line. Now, you're probably thinking that being first in line means that I'm next. You silly, silly person. When my turn came up, a middle-aged dude in a huge hurry rushed to the window. "SOMEONE ELSE WILL HAVE TO WAIT ON YOU," he said to me and then said to the worker, "I'm just getting one thing. I just need a box to wrap something. It's in my car. I'm in a huge hurry and I'm not waiting in that line. Have you seen that line? Why don't you have more windows open?" Another ten minutes went by. I finally got my package after thirty minutes and trudged home to rethink my life choices. The next day, I had another pink slip. Frodo had it so good. He only had to go the one time.